Want to do some woodworking and look cool during the process? The new Onyx limited edition series of tools from Powermatic can help you out with both. The black and gold color scheme on the Onyx tools has us thinking Powermatic should just make it their default color choice. 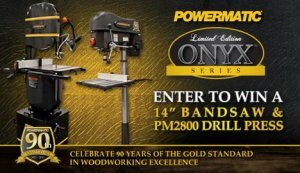 Most of the time limited edition tools will end up costing you big, but you have a chance to win a Powermatic 14-inch Bandsaw and a PM2800 Drill Press valued at $2,804. "The ONYX series PWBS-14CS Bandsaw. has an expansive 15" x 20" two-piece, cast iron tabletop. A balanced, nine-spoke cast iron wheel makes for smooth blade travel. The Carter™ quick-tension release lever makes blade changes a snap. A micro-adjustable dual-bearing blade guide system is featured at two tracking points; above and below the table. The PM2800 ONYX Series Drill Press features a single-handle speed changer, which allows the user to run the full range of speeds without ever touching a belt. A digital readout displays the exact speed the spindle is traveling. For maximum torque, this drill press features a motor that's larger any other drill press in its class. Twin LED lights illuminates the work area, while twin lasers pinpoint the bits entry on the workpiece. The work table is expandable and also considered the industry's largest in its class. "